Are there some things that you wish you could find when you are out looking but you really don’t expect to find those things at a price you would be willing to pay? 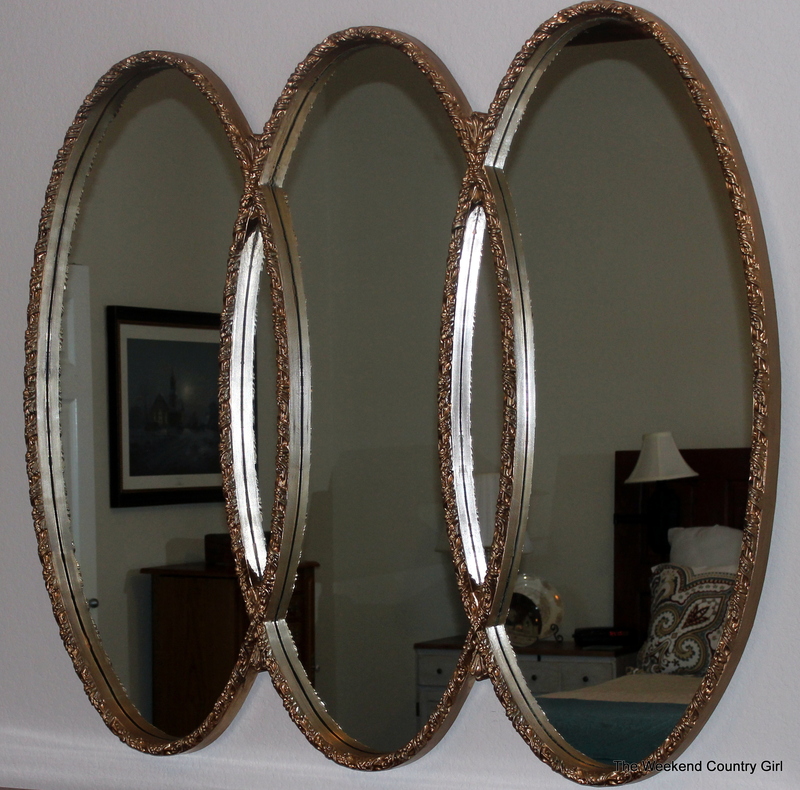 I have a list of things that fall into dream junk category, and for some reason, mirrors are usually at the top of the list. 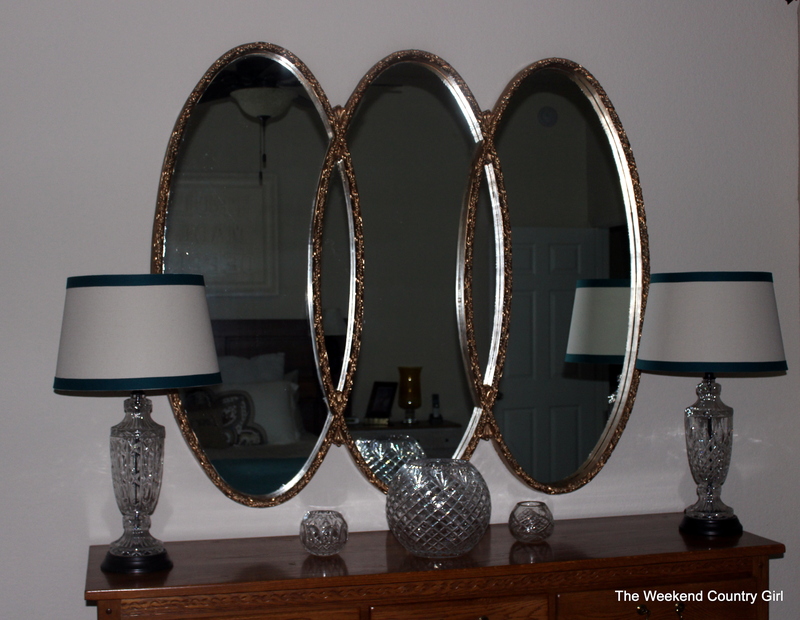 Vintage mirrors that are ornate are at the top of the top list. Number one on the top of the top list has been a large ornate mirror for above my dresser. 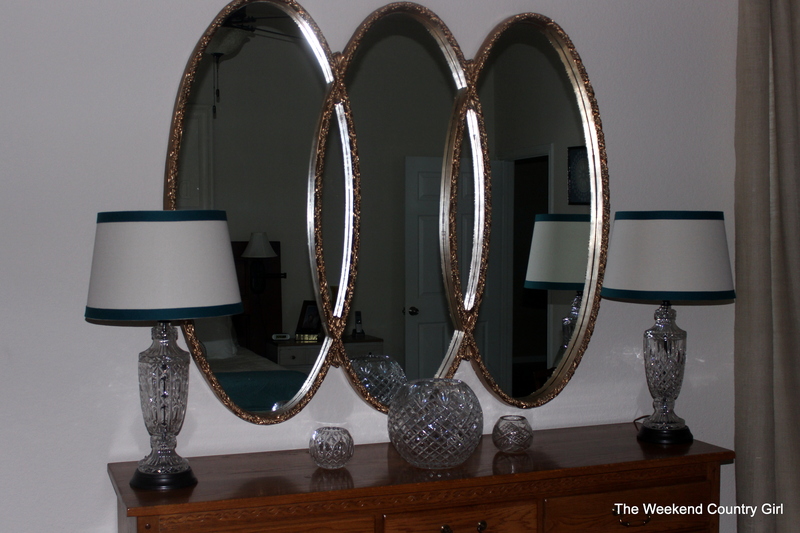 I have had a large mirror I bought at Ross years ago above the dresser. 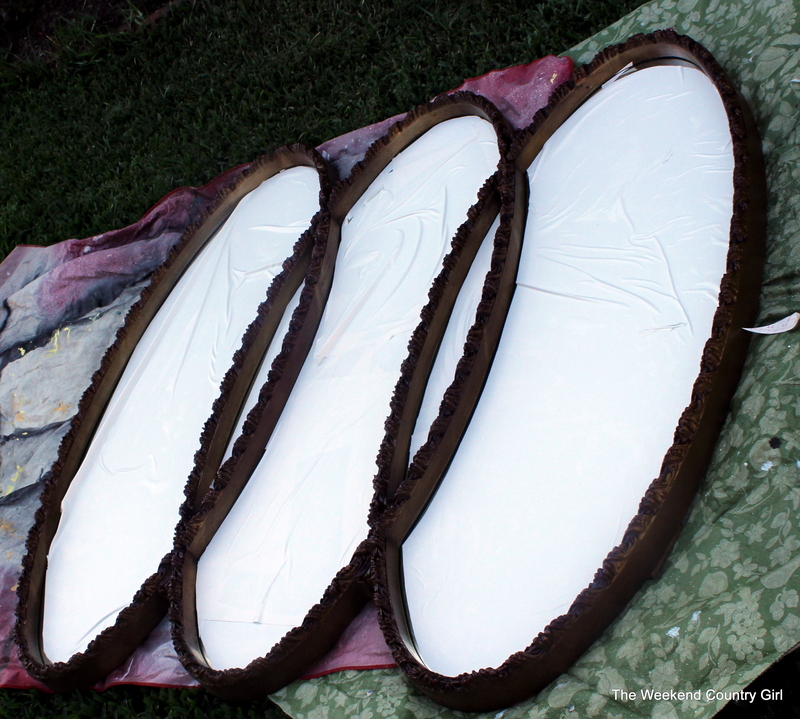 It was better than the original triple oak folding mirror that came with the set, especially after I glazed it. 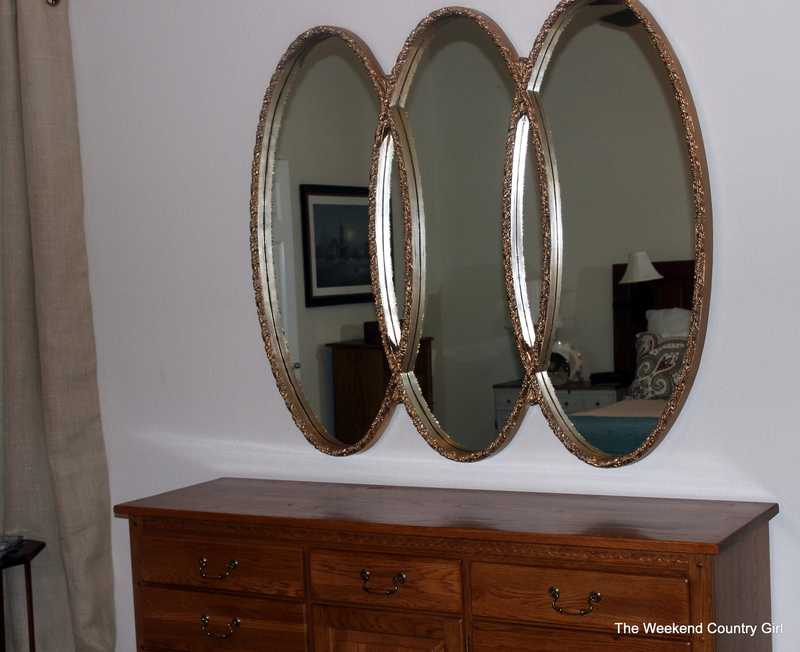 Recently I ran across THE mirror I thought I would never find at a reasonable price; a vintage triple oval mirror from Syracuse Ornamental Company (Syroco). It made from a wood/polymer resin, not just a plastic mold, so I know it was probably produced after 1962 and before 1965. 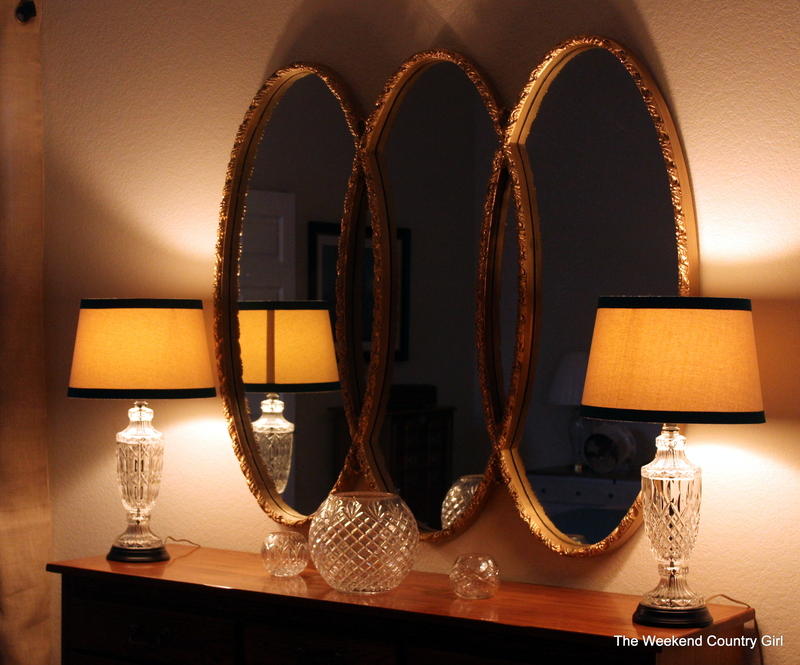 I was born in 1961 and grew up seeing these beautiful gold mirrors. 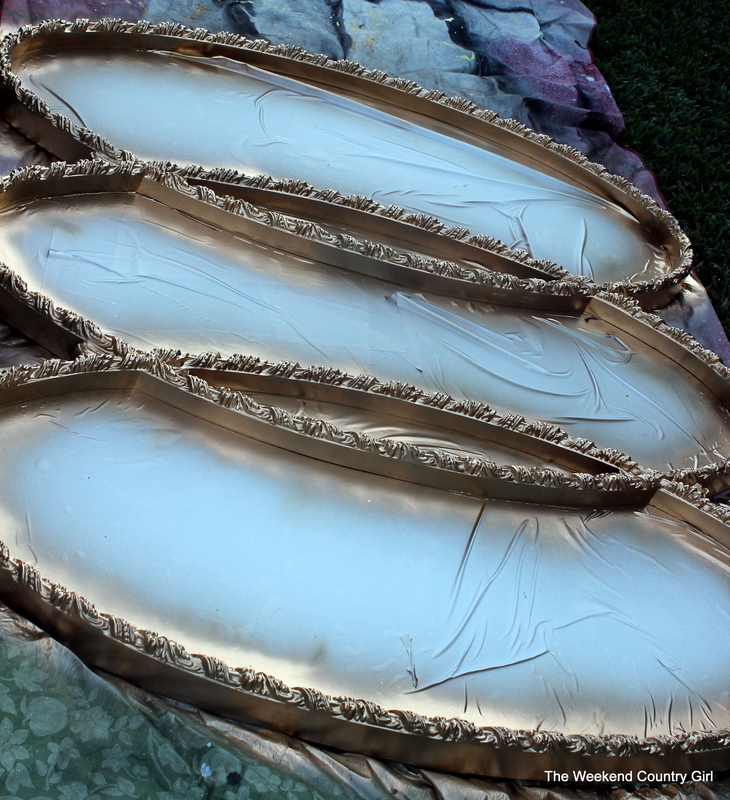 They were always gold, although they varied between being super ornate bright shiny gold to being antique gold not so ornate. 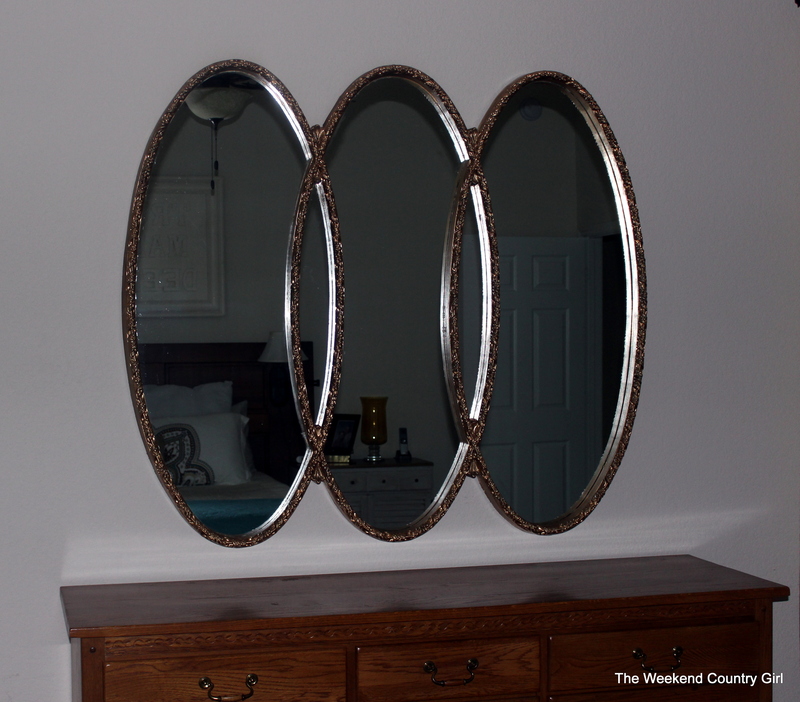 The mirror I found online had been hung where the sun had faded it then someone tried to paint it a brownish color. I snagged it for $20.00 and could not wait to get started on her makeover. 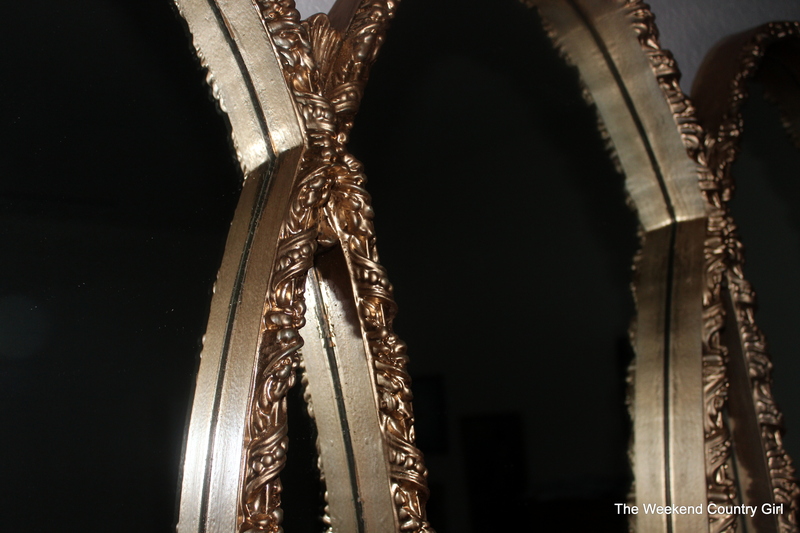 I thought I would gold leaf the mirror frame until I priced it out. It would have been fourty bucks for the gold leaf and adhesive. All that money on a technique I had never tried…no thank you. 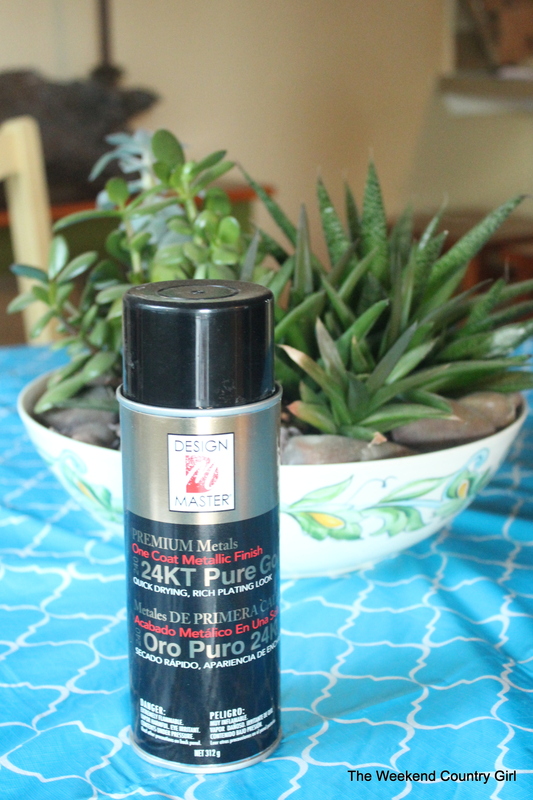 A quick search online led me to Design Masters spray paint in 24 carat gold color. It is a great gold color that I will be using again. It was less than $4.50 for the can at Michaels with a coupon. I covered all the mirror with contact paper from Dollar Tree. It is a really cheap masking option if you have to cover a large area. I love the color and will be using it for some accent pieces as is, but for our bedroom I wanted a more time-worn look. The solution was another product I had never used, tinted wax. I checked the price of tinted wax and Wow! 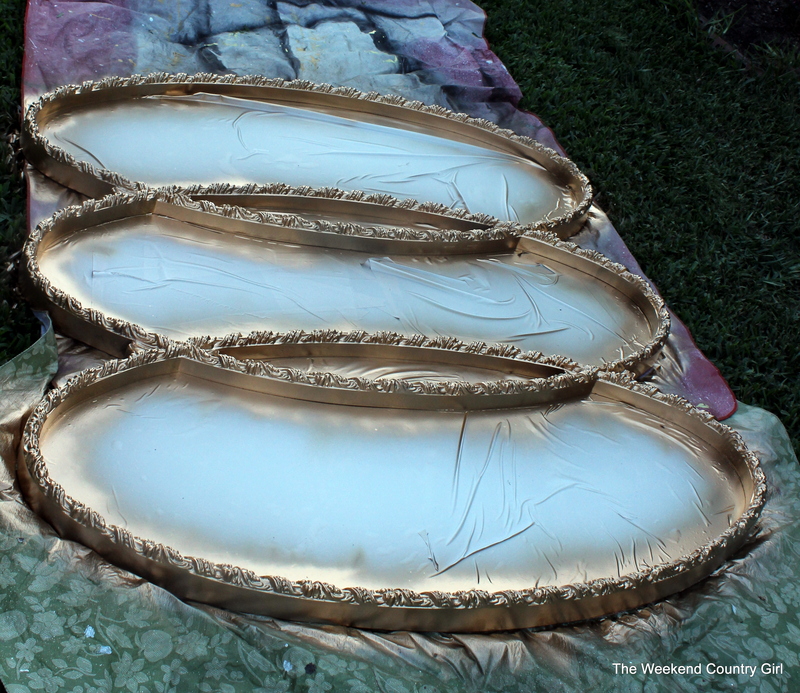 As my father in law would have said “They are proud of that stuff.” I could not justify paying almost as much for the wax as I payed for the mirror. A quick search on the internet and I found Dee at Deeconstructed blog’s tinted wax “recipe”. 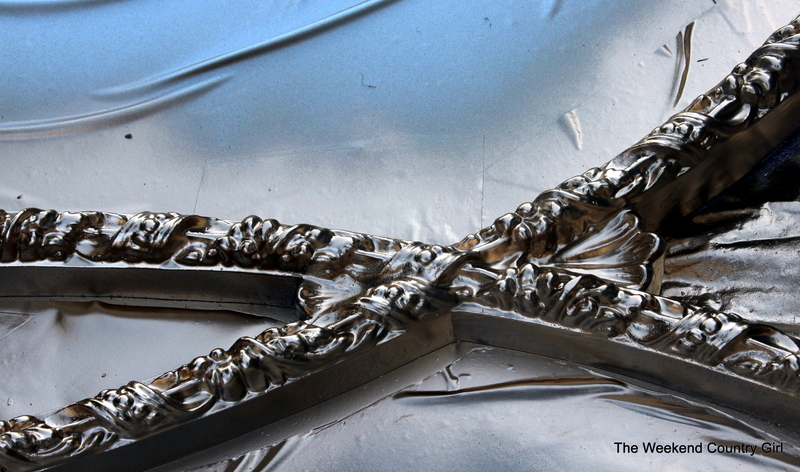 You can find it by clicking here: Tinted Wax. The best part; I had everything at the house. Woo Hoo! Waxing was easier than I thought, just a lot of rubbing with a clean cloth. After removing the contact paper and cleaning up the areas that spay paint got on the glass, here is the finished product. It took work to hang the 60 pound sucker but it was so worth it. I love the elegant look in our bedroom. I wonder what color the wall behind the bed should be? 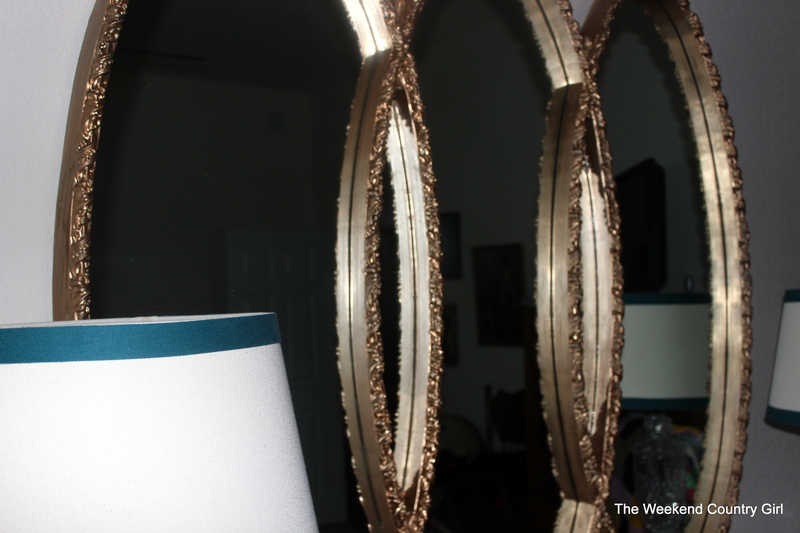 I have used the Rustoleum paint on other projects but the design master is a gold that is closer to gold leaf. I think the design aster looks richer. Thanks for the info on the design master gold paint. I will clip my Michaels coupon and give it a try. Love love love……what a score! I agree! I could not get there soon enough when posted. The crazy thing was that the owner had it in a garage sale and it did no sell. Lucky me. This is fantastic! I love it with the cut crystal pieces and a deep purple candle or rocks in the center piece would tie this together fantabulously. I’m so glad my ‘recipe’ worked for ya. I certainly don’t believe in paying for things others are so ‘proud of’ (love that saying!) Like I said on your FB page, the best things I’ve found w/the DIY wax tint is that aside from your options being limitless, you can layer the colors for some really cool effects. In my real life, I have a cool collection of old jewelry boxes that go on the dresser but they don’t photograph well. Last night I pulled the crystal out of storage for the photo. My giant dog loves to chase the cat through the bedroom so no breakables on surfaces that can be jumped on. Welcome to my real life. I am also not allowed to paint the furniture in the bedroom. Hubby wants one room with wood, and I can live with that as long as I can paint the walls and decorate around it. The rest of the house is fair game. I love the honesty. Maybe this calls for a Blogger’s Real Life series – a set of before & after shots showing the ‘staged’ vs ‘reality’ photos of a project’s after life. I totally agree. Our house is really pretty cool, but with our pets, my son and daughter in law living with us, and full time jobs, it isn’t always pristine. I also photograph a lot outside because the light in my house stinks. 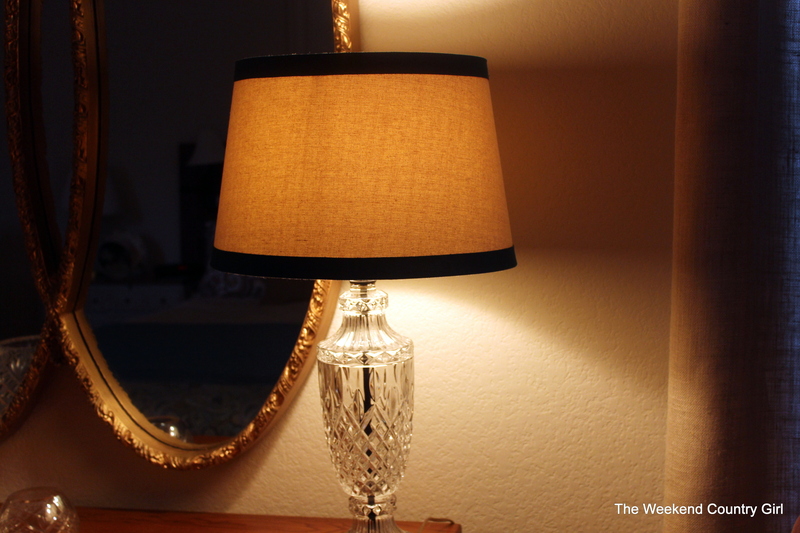 I am borrowing some lighting from a photographer this summer to get good shots of the house. I will join in if you do a series. We will be redoing our bathroom this summer so I am positive I will be storing tools in the tub . I always wanted to do a series of the garages/ workspace of bloggers. Ohhh I like the garage/workspace idea. A lot of DIY bloggers seem to have their husbands/fathers pitching in so their “workspace” might be more their office (where they write) than where they work. I’ve posted pics of my basement shop & my garage space several times on FB but I haven’t really put it together on my website. That’s probably because neither have ever fully been ‘put together’ appropriately for online viewing! Beautiful mirror. My sister-in-law redid one like that. They are so unusual!